Grill’s on! When Three Buns invited us to try some of their succulent burgers, we knew we had to say yes. For the uninitiated, Three Buns started off churning out juicy burgers and succulent dawgs at Potato Head Singapore, one of the hippest hangouts in town. Their popularity grew, and now this well-loved burger joint has set up shop along Robertson Quay to cater to the growing demands and appetites of their loyal customers. First thing we noticed is that they don’t serve utensils. That’s because they strongly believe in sustainability, hence the recycled wood walls and minimal use of utensils. Also, Chef Adam Penney recommends you to chow down these bad boys with your bare hands. So don’t hesitate to get your hands dirty like how we did! Fun fact: The chef loves hip hop so if you’re a fan, you’ll love the old school hip hop music playing in the background. You can probably also relate to burger names like Redman and Bun DMC, and their personalised stickers are adorable too! Every bite of the Sly Stallone is refreshing and satisfying. The burger is packed with pesto flavour, but not so overpowering and you can still taste the layer of flavours from the Australian Dorper lamb patty, Quader de Cavra cheese, juicy heritage tomato slices, and crunchy lettuce. The lamb patty is tender and fragrant so it’s easy on the taste buds. Sandwiched between two thick toasted demi brioche bun, be prepared to get messy with this one. Love beef rendang? This one’s right up your alley. Redman burger does an interesting spin on beef rendang. In one bite, you can taste the tender 24-hour cooked black Angus beef cheek rendang, pickle mooli (radish), and cucumber slices. The burger hits you with a subtle coconut flavour from the coconut mayo and toasted coconut demi brioche buns. This bad boy has a familiar yet unique local taste with a sweet and spicy kick. Big Krabby Kane is our favourite. The blue swimmer crab patty covered in salted egg mayonnaise with a touch of chilli, lime, and coriander come together perfectly. We were pleasantly surprised by how thick and flavourful the patty is. The crisp lettuce adds a textural crunch to the burger. Shiok is the word to describe this dish. Besides the burgers, another must-have on the menu is the Miso Dirty Fries. Crispy potato slices drenched in miso béarnaise sauce, smoked chicken sausage and floss, chives, scallions, and pickle chilli- this dish will whisk you away to sinful nirvana! What better way to pair your burger than a cold, creamy milkshake? We were thrilled to try 3 MONKEYS, Monkey Shoulder infused banana milkshake. The kick from the whisky perks you right up and the hint of banana and generous amount of whipped cream mellows out the taste from the whisky. Before you know it, you would have finished this thirst-quencher in no time. If that isn’t enough to tempt you, we’ve got good news to share! 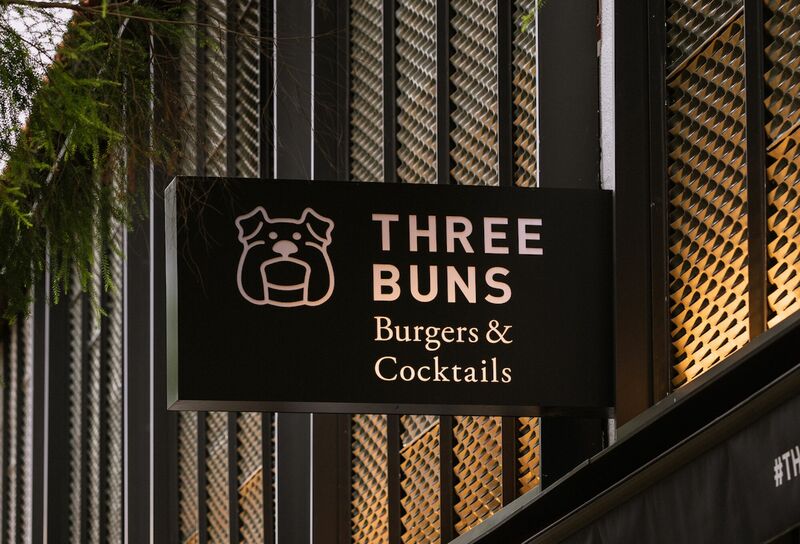 Add Three Buns to your supper list as they are offering 1-for-1 burgers or dawgs from Tuesdays to Sundays, starting from 9.30pm. Wind down after work at this relaxing spot after 5pm every Tuesdays to Thursdays to enjoy cocktails and beers at a starting price of $8. The best part? Bring along your furry babies and they get to devour angus beef patties for free when you dine here!